All designated District Presidents, Secretaries, and Treasurers in the BHS Member Center are authorized to download district level roster data. 3. Click on the District Roster option towards the left-hand side. 5. District Presidents, Secretaries, and Treasurers can download a district roster in an MS Excel format, you can select the Download Button towards the right-hand side. 6. To switch and view Inactive Members select the Switch to view Inactive Members button towards the right-hand side. You also can select the Download button to download that particular roster in an MS Excel Format. 3. Click on the District Summary option towards the left-hand side. 4. 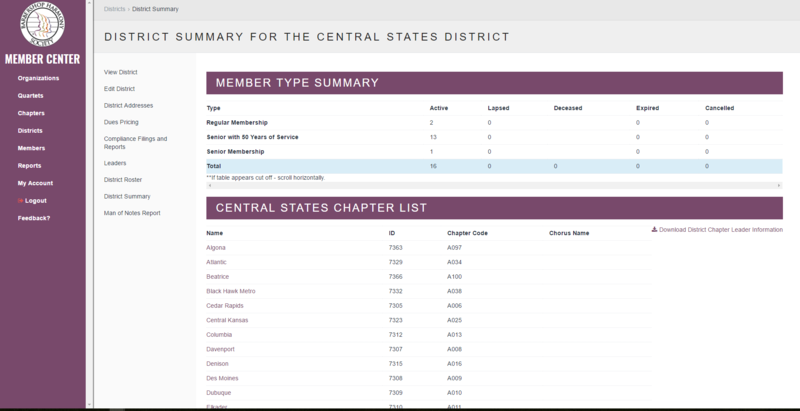 A Member Type Summary, as well as a Chapter List, will display. 5. District Presidents, Secretaries, and Treasurers can download District Chapter Leader Information in an MS Excel format, you can select the Download Button towards the right-hand side. 6. Currently, the information that is available download are the primary contacts of Chapters: Presidents, Secretaries, Treasurers, Board Members at Large, District Delegates, and Chorus Directors. In the future, we will add all chapter roles available for download.